Organization development (OD) is a field of research, theory and practice dedicated to expanding the knowledge and effectiveness of people to accomplish more successful organizational change and performance. OD emerged out of human relations studies in the 1930s, during which psychologists realized that organizational structures and processes influence worker behavior and motivation. More recently, work on OD has expanded to focus on aligning organizations with their rapidly changing and complex environments through organizational learning, knowledge management and transformation of organizational norms and values. Key concepts of OD theory include: organizational climate (the mood or unique “personality” of an organization, which includes attitudes and beliefs that influence members’ collective behavior), organizational culture (the deeply-seated norms, values and behaviors that members share) and organizational strategies (how an organization identifies problems, plans action, negotiates change and evaluates progress). Organization development is an ongoing, systematic process of implementing effective organizational change. OD is known as both a field of science focused on understanding and managing organizational change and as a field of scientific study and inquiry. It is interdisciplinary in nature and draws on sociology, psychology, particularly industrial and organizational psychology, and theories of motivation, learning, and personality. Although behavioral science has provided the basic foundation for the study and practice of OD, new and emerging fields of study have made their presence felt. Experts in systems thinking and organizational learning, structure of intuition in decision making, and coaching (to name a few) whose perspective is not steeped in just the behavioral sciences, but a much more multi-disciplinary and inter-disciplinary approach, have emerged as OD catalysts or tools. Organization development is a growing field that is responsive to many new approaches. Kurt Lewin (1898–1947) is widely recognized as the founding father of OD, although he died before the concept became current in the mid-1950s. From Lewin came the ideas of group dynamics and action research which underpin the basic OD process as well as providing its collaborative consultant/client ethos. Institutionally, Lewin founded the "Research Center for Group Dynamics" (RCGD) at MIT, which moved to Michigan after his death. RCGD colleagues were among those who founded the National Training Laboratories (NTL), from which the T-groups and group-based OD emerged. Kurt Lewin played a key role in the evolution of organization development as it is known today. As early as World War II, Lewin experimented with a collaborative change process (involving himself as consultant and a client group) based on a three-step process of planning, taking action, and measuring results. This was the forerunner of action research, an important element of OD, which will be discussed later. Lewin then participated in the beginnings of laboratory training, or T-groups, and, after his death in 1947, his close associates helped to develop survey-research methods at the University of Michigan. These procedures became important parts of OD as developments in this field continued at the National Training Laboratories and in growing numbers of universities and private consulting firms across the country. Two of the leading universities offering doctoral level degrees in OD are Benedictine University and the Fielding Graduate University. Douglas and Richard Beckhard while "consulting together at General Mills in the 1950s, the two coined the term organization development (OD) to describe an innovative bottoms-up change effort that fit no traditional consulting categories" (Weisbord, 1987, p. 112). The failure of off-site laboratory training to live up to its early promise was one of the important forces stimulating the development of OD. Laboratory training is learning from a person's "here and now" experience as a member of an ongoing training group. Such groups usually meet without a specific agenda. Their purpose is for the members to learn about themselves from their spontaneous "here and now" responses to an ambiguous hypothetical situation. Problems of leadership, structure, status, communication, and self-serving behavior typically arise in such a group. The members have an opportunity to learn something about themselves and to practice such skills as listening, observing others, and functioning as effective group members. Herbert A. Shepard conducted the first large-scale experiments in Organization Development in the late fifties. As formerly practiced (and occasionally still practiced for special purposes), laboratory training was conducted in "stranger groups," or groups composed of individuals from different organizations, situations, and backgrounds. A major difficulty developed, however, in transferring knowledge gained from these "stranger labs" to the actual situation "back home". This required a transfer between two different cultures, the relatively safe and protected environment of the T-group (or training group) and the give-and-take of the organizational environment with its traditional values. This led the early pioneers in this type of learning to begin to apply it to "family groups" — that is, groups located within an organization. From this shift in the locale of the training site and the realization that culture was an important factor in influencing group members (along with some other developments in the behavioral sciences) emerged the concept of organization development. Providing opportunities for each organization member, as well as for the organization itself, to develop to their full potential. Treating each human being as a person with a complex set of needs, all of which are important to their work and their life. Differentiating OD from other change efforts such as- 1. Operation management 2. Training and Development 3. Technological innovations....etc. To increase employees' level of satisfaction and commitment. To increase the organization's problem solving. Making individuals in the organization aware of the vision of the organization. Organizational development helps in making employees align with the vision of the organization. Strengthening inter-personnel trust, cooperation, and communication for the successful achievement of organizational goals. According to organizational development thinking, organization development provides managers with a vehicle for introducing change systematically by applying a broad selection of management techniques. This, in turn, leads to greater personal, group, and organizational effectiveness. A change agent in the sense used here is not a technical expert skilled in such functional areas as accounting, production, or finance. The change agent is a behavioral scientist who knows how to get people in an organization involved in solving their own problems. A change agent's main strength is a comprehensive knowledge of human behavior, supported by a number of intervention techniques (to be discussed later). The change agent can be either external or internal to the organization. An internal change agent is usually a staff person who has expertise in the behavioral sciences and in the intervention technology of OD. Beckhard reports several cases in which line people have been trained in OD and have returned to their organizations to engage in successful change assignments. In the natural evolution of change mechanisms in organizations, this would seem to approach the ideal arrangement. Researchers at the University of Oxford found that leaders can be effective change agents within their own organizations if they are strongly committed to 'knowledge leadership' targeted towards organizational development. In their three-year study of UK healthcare organizations, the researchers identified three different mechanisms through which knowledge leaders actively 'transposed', 'appropriated' or 'contended' change concepts, effectively translating and embedding these in organizational practice. Qualified change agents can be found on some university faculties, or they may be private consultants associated with such organizations as the National Training Laboratories Institute for Applied Behavioral Science (Washington, D.C.) University Associates (San Diego, California), the Human Systems Intervention graduate program in the Department of Applied Human Sciences (Concordia University, Montreal, Canada), Navitus (Pvt) Ltd (Pakistan), MaxFoster Global and similar organizations. The change agent may be a staff or line member of the organization who is schooled in OD theory and technique. In such a case, the "contractual relationship" is an in-house agreement that should probably be explicit with respect to all of the conditions involved except the fee. The initiative for OD programs often comes from an organization that has a problem or anticipates facing a problem. This means that top management or someone authorized by top management is aware that a problem exists and has decided to seek help in solving it. There is a direct analogy here to the practice of psychotherapy: The client or patient must actively seek help in finding a solution to his problems. This indicates a willingness on the part of the client organization to accept help and assures the organization that management is actively concerned. One of the outstanding characteristics of OD that distinguishes it from most other improvement programs is that it is based on a "helping relationship." Some believe that the change agent is not a physician to the organization's ills; that s/he does not examine the "patient," make a diagnosis, and write a prescription. Nor does she try to teach organizational members a new inventory of knowledge which they then transfer to the job situation. Using theory and methods drawn from such behavioral sciences as industrial/organizational psychology, industrial sociology, communication, cultural anthropology, administrative theory, organizational behavior, economics, and political science, the change agent's main function is to help the organization define and solve its own problems. The basic method used is known as action research. This approach, which is described in detail later, consists of a preliminary diagnosis, collecting data, feedback of the data to the client, data exploration by the client group, action planning based on the data, and taking action. OD deals with a total system — the organization as a whole, including its relevant environment — or with a subsystem or systems — departments or work groups — in the context of the total system. Parts of systems — for example, individuals, cliques, structures, norms, values, and products — are not considered in isolation; the principle of interdependency — that change in one part of a system affects the other parts — is fully recognized. Thus, OD interventions focus on the total culture and cultural processes of organizations. The focus is also on groups, since the relevant behavior of individuals in organizations and groups is generally a product of the influences of groups rather than of personalities. The objective of OD is to improve the organization's capacity to handle its internal and external functioning and relationships. This includes improved interpersonal and group processes, more effective communication, enhanced ability to cope with organizational problems of all kinds. It also involves more effective decision processes, more appropriate leadership styles, improved skill in dealing with destructive conflict, as well as developing improved levels of trust and cooperation among organizational members. These objectives stem from a value system based on an optimistic view of the nature of man — that man in a supportive environment is capable of achieving higher levels of development and accomplishment. Essential to organization development and effectiveness is the scientific method — inquiry, a rigorous search for causes, experimental testing of hypotheses, and review of results. Employees assume personal responsibility and accountability for outcomes of their work. Employees monitor their own performance and seek feedback on how well they are accomplishing their goals. Employees manage their performance and take corrective action when necessary to improve their and the performance of other group members. Employees seek guidance, assistance, and resources from the organization when they do not have what they need to do the job. Employees help members of their work group and employees in other groups to improve job performance and raise productivity for the organization as a whole. The ultimate aim of OD practitioners is to "work themselves out of a job" by leaving the client organization with a set of tools, behaviors, attitudes, and an action plan with which to monitor its own state of health and to take corrective steps toward its own renewal and development. This is consistent with the systems concept of feedback as a regulatory and corrective mechanism. Purposes: The organization members are clear about the organization's mission and purpose and goal agreements, whether people support the organization's purpose. Structure: How is the organization's work divided up? The question is whether there is an adequate fit between the purpose and the internal structure. Relationship: Between individuals, between units or departments that perform different tasks, and between the people and requirements of their jobs. Rewards: The consultant should diagnose the similarities between what the organization formally rewarded or punished members for. Leadership: Is to watch for blips among the other boxes and maintain balance among them. Helpful mechanism: Is a helpful organization that must attend to in order to survive which as planning, control, budgeting, and other information systems that help organization member accomplish. In recent years, serious questioning has emerged about the relevance of OD to managing change in modern organizations. The need for "reinventing" the field has become a topic that even some of its "founding fathers" are discussing critically. With this call for reinvention and change, scholars have begun to examine organization development from an emotion-based standpoint. For example, deKlerk (2007) writes about how emotional trauma can negatively affect performance. Due to downsizing, outsourcing, mergers, restructuring, continual changes, invasions of privacy, harassment, and abuses of power, many employees experience the emotions of aggression, anxiety, apprehension, cynicism, and fear, which can lead to performance decreases. deKlerk (2007) suggests that in order to heal the trauma and increase performance, O.D. practitioners must acknowledge the existence of the trauma, provide a safe place for employees to discuss their feelings, symbolize the trauma and put it into perspective, and then allow for and deal with the emotional responses. One method of achieving this is by having employees draw pictures of what they feel about the situation, and then having them explain their drawings with each other. Drawing pictures is beneficial because it allows employees to express emotions they normally would not be able to put into words. Also, drawings often prompt active participation in the activity, as everyone is required to draw a picture and then discuss its meaning. The use of new technologies combined with globalization has also shifted the field of organization development. Roland Sullivan (2005) defined Organization Development with participants at the 1st Organization Development Conference for Asia in Dubai-2005 as "Organization Development is a transformative leap to a desired vision where strategies and systems align, in the light of local culture with an innovative and authentic leadership style using the support of high tech tools. Bob Aubrey (2015) introduced KDIs (Key Development Indicators) to help organisations go beyond performance and align strategy, organisations and individuals and argued that fundamental challenges such as robotics, artificial intelligence and genetics prefigure a regeneration of the field. Wendell L French and Cecil Bell defined organization development (OD) at one point as "organization improvement through action research". If one idea can be said to summarize OD's underlying philosophy, it would be action research as it was conceptualized by Kurt Lewin and later elaborated and expanded on by other behavioral scientists. Concerned with social change and, more particularly, with effective, permanent social change, Lewin believed that the motivation to change was strongly related to action: If people are active in decisions affecting them, they are more likely to adopt new ways. "Rational social management", he said, "proceeds in a spiral of steps, each of which is composed of a circle of planning, action, and fact-finding about the result of action". "Unfreezing": Faced with a dilemma or disconfirmation, the individual or group becomes aware of a need to change. "Changing": The situation is diagnosed and new models of behavior are explored and tested. "Refreezing": Application of new behavior is evaluated, and if reinforced, adopted. Figure 1 summarizes the steps and processes involved in planned change through action research. Action research is depicted as a cyclical process of change. The cycle begins with a series of planning actions initiated by the client and the change agent working together. The principal elements of this stage include a preliminary diagnosis, data gathering, feedback of results, and joint action planning. In the language of systems theory, this is the input phase, in which the client system becomes aware of problems as yet unidentified, realizes it may need outside help to effect changes, and shares with the consultant the process of problem diagnosis. The second stage of action research is the action, or transformation, phase. This stage includes actions relating to learning processes (perhaps in the form of role analysis) and to planning and executing behavioral changes in the client organization. As shown in Figure 1, feedback at this stage would move via Feedback Loop A and would have the effect of altering previous planning to bring the learning activities of the client system into better alignment with change objectives. Included in this stage is action-planning activity carried out jointly by the consultant and members of the client system. Following the workshop or learning sessions, these action steps are carried out on the job as part of the transformation stage. The third stage of action research is the output, or results, phase. This stage includes actual changes in behavior (if any) resulting from corrective action steps taken following the second stage. Data are again gathered from the client system so that progress can be determined and necessary adjustments in learning activities can be made. 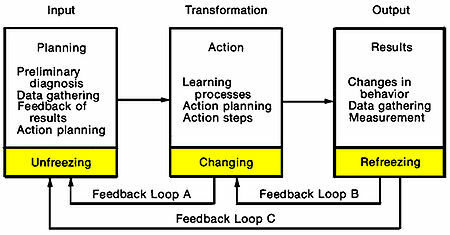 Minor adjustments of this nature can be made in learning activities via Feedback Loop B (see Figure 1). Major adjustments and reevaluations would return the OD project to the first, or planning, stage for basic changes in the program. The action-research model shown in Figure 1 closely follows Lewin's repetitive cycle of planning, action, and measuring results. It also illustrates other aspects of Lewin's general model of change. As indicated in the diagram, the planning stage is a period of unfreezing, or problem awareness. The action stage is a period of changing, that is, trying out new forms of behavior in an effort to understand and cope with the system's problems. (There is inevitable overlap between the stages, since the boundaries are not clear-cut and cannot be in a continuous process). The results stage is a period of refreezing, in which new behaviors are tried out on the job and, if successful and reinforcing, become a part of the system's repertoire of problem-solving behavior. Action research is problem centered, client centered, and action oriented. It involves the client system in a diagnostic, active-learning, problem-finding, and problem-solving process. Data are not simply returned in the form of a written report but instead are fed back in open joint sessions, and the client and the change agent collaborate in identifying and ranking specific problems, in devising methods for finding their real causes, and in developing plans for coping with them realistically and practically. Scientific method in the form of data gathering, forming hypotheses, testing hypotheses, and measuring results, although not pursued as rigorously as in the laboratory, is nevertheless an integral part of the process. Action research also sets in motion a long-range, cyclical, self-correcting mechanism for maintaining and enhancing the effectiveness of the client's system by leaving the system with practical and useful tools for self-analysis and self-renewal. "Interventions" are principal learning processes in the "action" stage (see Figure 1) of organization development. Interventions are structured activities used individually or in combination by the members of a client system to improve their social or task performance. They may be introduced by a change agent as part of an improvement program, or they may be used by the client following a program to check on the state of the organization's health, or to effect necessary changes in its own behavior. "Structured activities" mean such diverse procedures as experiential exercises, questionnaires, attitude surveys, interviews, relevant group discussions, and even lunchtime meetings between the change agent and a member of the client organization. Every action that influences an organization's improvement program in a change agent-client system relationship can be said to be an intervention. Interventions range from those designed to improve the effectiveness of individuals through those designed to deal with teams and groups, intergroup relations, and the total organization. There are interventions that focus on task issues (what people do), and those that focus on process issues (how people go about doing it). Finally, interventions may be roughly classified according to which change mechanism they tend to emphasize: for example, feedback, awareness of changing cultural norms, interaction and communication, conflict, and education through either new knowledge or skill practice. One of the most difficult tasks confronting the change agent is to help create in the client system a safe climate for learning and change. In a favorable climate, human learning builds on itself and continues indefinitely during man's lifetime. Out of new behavior, new dilemmas and problems emerge as the spiral continues upward to new levels. In an unfavorable climate, in contrast, learning is far less certain, and in an atmosphere of psychological threat, it often stops altogether. Unfreezing old ways can be inhibited in organizations because the climate makes employees feel that it is inappropriate to reveal true feelings, even though such revelations could be constructive. In an inhibited atmosphere, therefore, necessary feedback is not available. Also, trying out new ways may be viewed as risky because it violates established norms. Such an organization may also be constrained because of the law of systems: If one part changes, other parts will become involved. Hence, it is easier to maintain the status quo. Hierarchical authority, specialization, span of control, and other characteristics of formal systems also discourage experimentation. A belief in man as a rational, self-educating being fully capable of learning better ways to do things. A few examples of interventions include team building, coaching, Large Group Interventions, mentoring, performance appraisal, downsizing, TQM, and leadership development. Jump up ^ "Organizational Development Theory". Retrieved 2016-01-20. Jump up ^ Weisbord, Marvin. (1987). Productive Workplace: Organizing and managing for dignity, meaning and community. Jossey-Bass Publishers, San Francisco. ^ Jump up to: a b c d Richard Arvid Johnson (1976). Management, systems, and society : an introduction. Pacific Palisades, Calif.: Goodyear Pub. Co. pp. 223–229. ISBN 0-87620-540-6. OCLC 2299496. Cite error: Invalid <ref> tag; name "Johnson" defined multiple times with different content (see the help page). Jump up ^ Newton Margulies (1972). Organizational Development: Values, Process, and Technology. New York, NY: McGraw-Hill Book Co. p. 3. ^ Jump up to: a b Richard Beckhard (1969). Organization development: strategies and models. Reading, Mass. : Addison-Wesley. p. 114. ISBN 0-87620-540-6. OCLC 39328. Cite error: Invalid <ref> tag; name "Beckhard" defined multiple times with different content (see the help page). ^ Jump up to: a b c Richard Arvid Johnson (1976). Management, systems, and society : an introduction. Pacific Palisades, Calif.: Goodyear Pub. Co. pp. 219–222. ISBN 9780876205402. OCLC 2299496. ^ Jump up to: a b Wendell L French; Cecil Bell. Organization development: behavioral science interventions for organization improvement. Englewood Cliffs, N.J.: Prentice-Hall. Cite error: Invalid <ref> tag; name "Wendell" defined multiple times with different content (see the help page). Jump up ^ Bradford, D.L. & Burke, W.W. eds, (2005). Organization Development. San Francisco: Pfeiffer. Jump up ^ Bradford, D.L. & Burke, W.W.(eds), 2005, Reinventing Organization Development. San Francisco: Pfeiffer. Jump up ^ deKler, M. (2007). Healing emotional trauma in organizations: An O.D. Framework and case study. Organizational Development Journal, 25(2), 49-56. Jump up ^ Aubrey, Bob (September 2015). The Measure of Man: Leading Human Development. McGraw Hill Education. ^ Jump up to: a b c Kurt Lewin (1958). Group Decision and Social Change. New York: Holt, Rinehart and Winston. p. 201. ^ Jump up to: a b c Richard Arvid Johnson (1976). Management, systems, and society: an introduction. Pacific Palisades, Calif.: Goodyear Pub. Co. pp. 224–226. ISBN 0-87620-540-6. OCLC 2299496. Jump up ^ Wendell L French; Cecil Bell (1973). Organization development: behavioral science interventions for organization improvement. Englewood Cliffs, N.J.: Prentice-Hall. chapter 8. ISBN 0-13-641662-4. OCLC 314258.